Returning for the Trinidad and Tobago Great Race in 2018, Total Monster took first place in the event for three years in a row. To borrow from an old expression, the chances of offshore powerboat racing returning to its halcyon days, when competitors disappeared into the horizon and returned some time later, are slim to none—and slim just left the building. Best described as near-shore offshore racing, what we have now is what we will have for the foreseeable future of the sport. Whether that fact causes you to wring your hands or clap them, it’s reality. 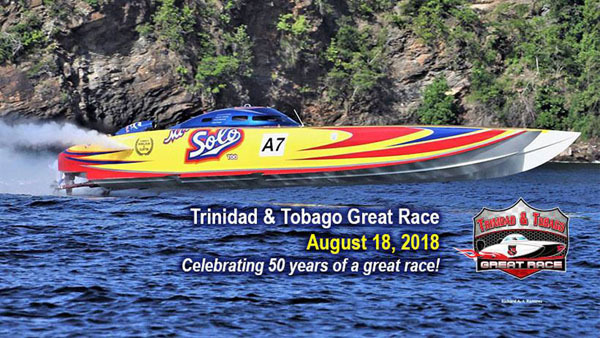 There is at least one exception: the Trinidad and Tobago Great Race put on by the Trinidad and Tobago Powerboat Association, which covers 115 miles—85- to 90-something of which are in the open Atlantic Ocean—between the twin islands off the coast of Venezuela. And come August 18, 2018, the event will celebrate its 50th anniversary. “In the Great Race, we run in proper, six- to 10-foot swells in the Atlantic Ocean,” said Joey Sabeeney, who co-owns Total Monster, a 46-foot Skater catamaran that formerly ran in the United States as Planetman, with Trinidad and Tobago Powerboat Association president Peter Peake. Sabeeney and Peake live in the Port of Spain area of Trinidad, where Peake owns a marina. They bought their 46-footer in 2010 and ran the boat during the 2011 TTPA season. They claimed first place overall in the Great Race from 2013 through 2015, then took the past two years off from the event. But they’re coming back for the 2018 contest. The Total Monster cat is powered by twin 1,550-hp engines from Sterling Performance. The engines currently are being refreshed at the Sterling facility in Milford, Mich., in advance of the upcoming TTPA racing season, which starts in January. The Great Race turns 50 years old next year. The TTPA has approximately 50 teams, according to Sabeeney. To qualify for the Great Race, members of the organization must compete in “three to four” shorter races—called regattas—during the regular season. Those races typically feature multiple four- to five-mile laps, as well as mile-long top-speed contests similar to kilo runs in the U.S. Classes in the event are divided by bracketed speeds, meaning competitors in each class are not allowed to exceed their class-defined velocity. They are: 60 mph, 70 mph, 80 mph, 90 mph, 120 mph and 130 mph. Sabeeney is hoping that a few U.S. teams will compete in the 2018 event given its pending milestone anniversary. 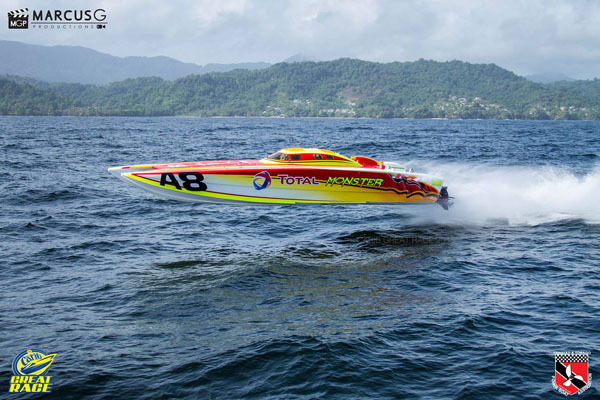 Regardless, on August 18 the fierce—and pretty much fearless— competitors in Trinidad and Tobago will face the open ocean in true offshore powerboat racing style, just as they have for the past 49 years. Editor’s Note: The author extends heartfelt thanks to Andrew Martin of the Toronto, Canada, area for his persistence and determination in bringing this story to his attention. Borden Light Marina Poker Run 13th Year! 42' Tiger FS - Anyone have info?